Welcome to Day 3 of the Authetique Paper and Zva Creative Celebrate Spring Blog Hop. Some of the designers from both companies are sharing projects created with Authentique's new Hope collection along with Zva Creative Crystal Gems and Flowers. If you missed Day 1 and 2 of the Hop, you can find links on the Zva Creative Blog. 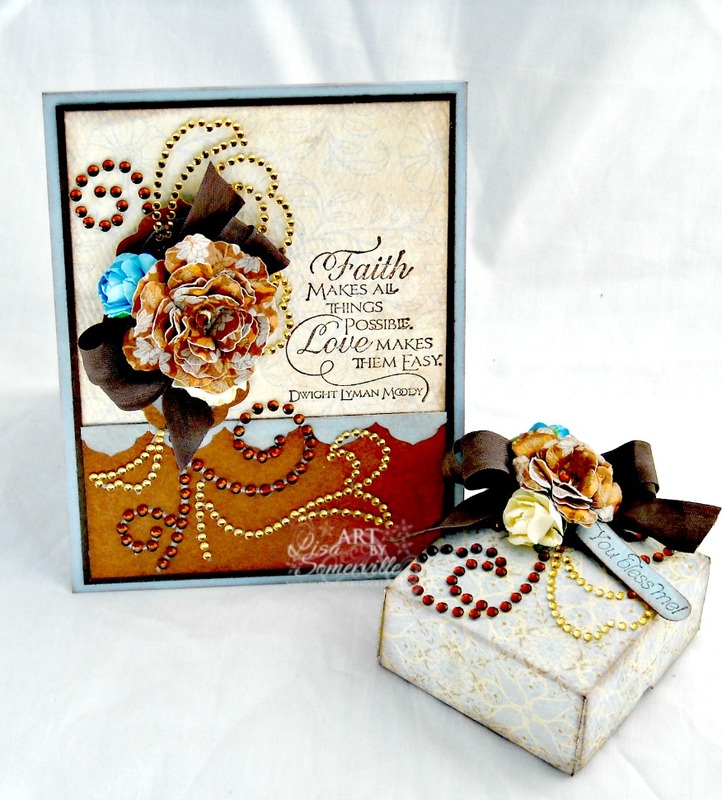 I created a card and gift box using papers from the Hope collection along with Zva's Gems/Flowers, and stamps from Our Daily Bread Designs. To create the box, I used the Simple Box Template from SVG Cuts, cutting the template from Authentique's Hope Collection using the Silhouette. *Note, I reduced the pattern by 60% so that I could use up some of the scraps of pattern paper. To embellish I added a Double Bow tied from Vintage Brown Seam Binding, Zva Creative Flourish Gems (CRB-05CB-105), Mini Roses in Cream/Blue (FLBK-03CB-132/FLBK-03CB-130). The larger flower you see on both the card and box were die cut from the Hope collection using Spellbinders Rose Creations Die. 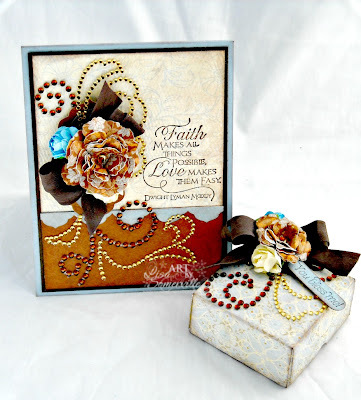 Here's a close up of the box, the sentiment is from Our Daily Bread Designs Thank You Sentiments set. Here's a close up of the card, which was embellished to coordinate with the box. The quote is from Our Daily Bread Designs Quote Collection 3 stamp set. Zva Creative will be selecting two lucky winners who comment along the three day blog hop to win a Zva prize package worth $30 and Authentique’s Hope collection. All comments must be received by 11:59pm on Monday, March 25th EDT. The winner will be announced on Zva's Blog on Tuesday, March 26th. That little bit of "teal" color with those gorgeous browns really makes for an awesome combination. 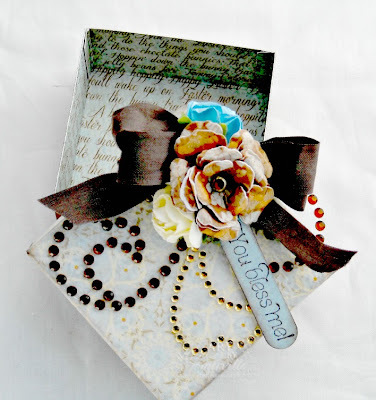 What a lovely project, and who wouldn't love receiving a gift box decorated so beautifully? Great job! Beautiful set! Love how perfectly the card and gift box are coordinated and so pretty are the flowers! Beautiful card and gift box. Nice project. I love te sentiment. I really like how you anchored the bottom of your card with the strong brown color. Darling box too! So many wonderful details! It's great that since you used patterned paper for the box that both inside and the outside are beautiful! Thanks so much for sharing! Gorgeous card! Love the bow behind the flower and the Zva goodies! Amazing,love the colors and the bling, but the flower is beautiful! A very pretty set indeed! Beautiful! I love the colors and the matching box! Stunning card and box! I love the layout of the card and the colors are so pretty. Fab co-ordinating projects... those flowers and swirls are so elegant - gorgeous! Beautiful creations, I just love the Hope collection with Zva's pretty bling. Oh this is lovely...the card is stunning but I just love the box! Love how you used the flourishes! Gorgeous!The card is fantastic-I love the quote.No Silhouette here.but I think I can figure out to make a box like yours.I love it! Lovely card and box set. The browns are so lovely together. The teal flower is such a nice little pop of color. Beautiful box and card set! Love the paper, crystals, and your gorgeous flowers!!! loving this card, love the orange and turquoise together-one of my favorites! Wow...beautiful use of the crystals here. Such a pretty card. 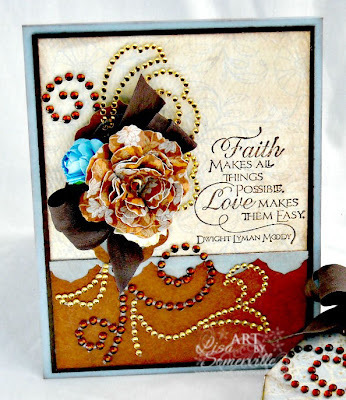 Lovely projects, great flowers and sentiment stamp. Such a stunning card I love the ZVA sparkle. Beautiful flowers!! Love the card!